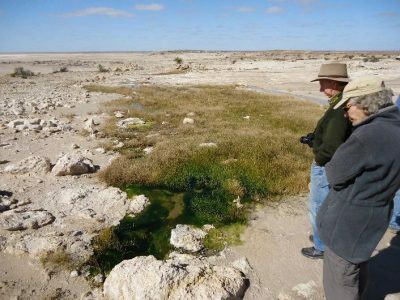 The State Department of Environment, Water and Natural Resources has recently completed a three year project, known as Desert Jewels, looking at the management of mound springs and the FOMS has had some involvement. As part of that project, fencing of several springs at Levi was proposed. An initial proposal to fence all of the springs at Levi was not supported by the Arabana Aboriginal Corporation and a revised and reduced fence alignment was marked out on the ground during a visit in 2016 by FOMS and Arabana Elder Uncle Dean Stuart. 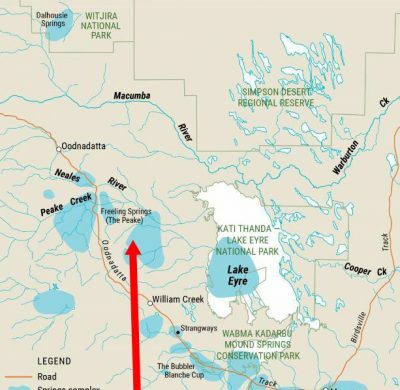 The Arabana Aboriginal Corporation subsequently endorsed the revised alignment which is shown in red on the image below. The area proposed for fencing is around 10 – 12 ha. Former lessees S Kidman and Co were fully supportive of the proposal but the on-ground works were not undertaken before the sale of the property to the Williams Cattle Company. In an effort to progress this matter, FOMS members Colin Harris, Bren Lay, Bruce Gotch and Simon Lewis met with Tony and Trevor Williams during the FOMS trip of August 2017. 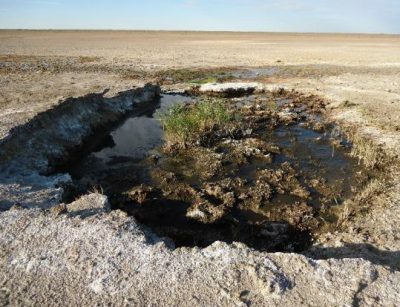 During this on-site discussion it was clear that the springs were being heavily impacted by cattle. Tony and Trevor agreed that the current situation was in nobody’s best interests. They stressed that any decision about fencing would need to be made by their company and noted that a watering point would still be needed in the vicinity. 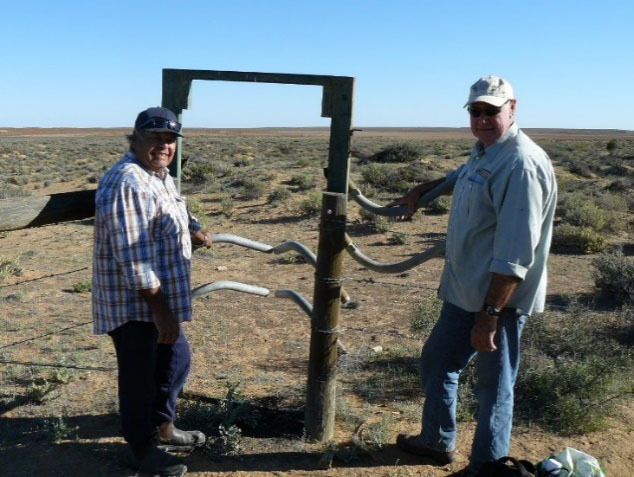 In this respect, the group inspected the bore nearby, currently used by cattle, but in need of an upgrade. 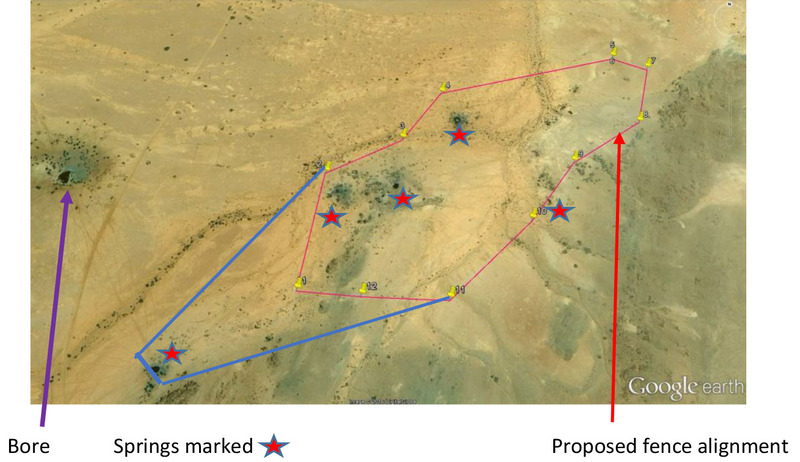 There was also some suggestion that the fencing could be extended to include the main spring in the bottom left of the image below, by following the alignment marked in blue on the image. The meeting was positive and FOMS is confident of a good outcome. FOMS has sent further information to the Williams Cattle Company and we await their decision. 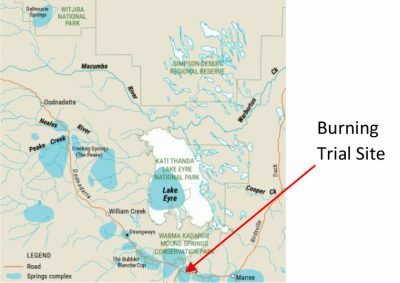 In our last newsletter we reported on a burning trial conducted on three springs on the Finniss Springs property, Bopeechee, Beatrice and a spring described as HBO 004, in May 2016. 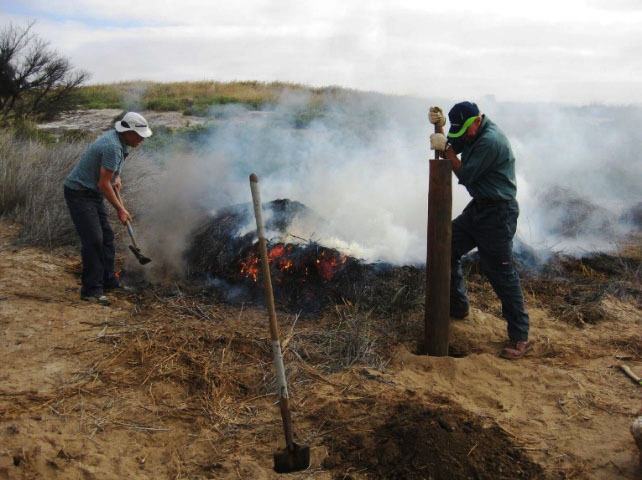 This trial was undertaken as part of DEWNR’s Desert Jewels project as an initial effort to assess the potential ongoing role of fire in the management of reeds, particularly Phragmites, in mound springs. Prolific growth of Phragmites has occurred at many springs that have been protected from cattle grazing to the apparent detriment of other wetland species. DEWNR and FOMS have been considering options for the active management of this prolific reed growth, with fire and periodic grazing (see also the Billa Kalina article) being two options for consideration. 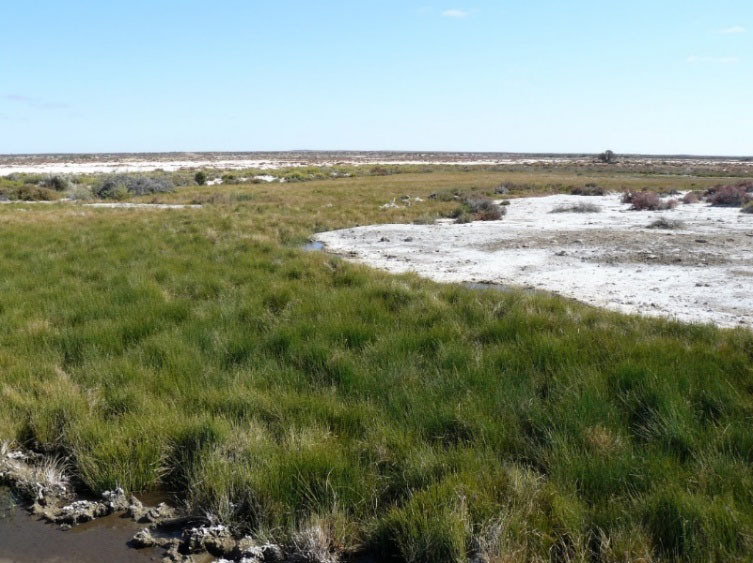 In July 2016 a FOMS group visited Finniss Springs and noted quite strong regrowth of Phragmites just 7 or 8 weeks after the trial burn. At the time, FOMS carried out some vegetation monitoring, measuring density and height of regrowth. However, in June 2017 a further FOMS inspection showed that the regrowth of Phragmites is being severely grazed by horses. The photos included here of Spring HBO 004 illustrate the situation. This has significantly complicated the monitoring program. While the horses remain in the area we are not simply monitoring the response of Phragmites to a trial burn but monitoring a combination of regrowth from fire and grazing impacts. Some discussion will be needed about the value of continuing the current vegetation monitoring or the need to adopt a different approach. 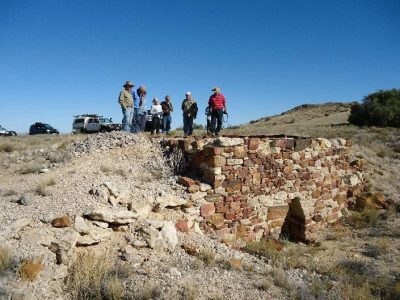 FOMS members will recall that FOMS established two walking trails at the Peake Overland Telegraph site in 2011 – the Creek Walk and the Copper Top Smelter and Mine Walk. Observations in August 2016 showed that both trails – particularly the Creek Walk – had been significantly eroded by the heavy rains of that year and needed repairs. In August 2017 a FOMS group travelled to the Peake to do the necessary repair work. The group comprised Colin Harris, Bruce Gotch, Stafford Dow, Bernice Cohen, Brian Donaghy, Bren and Elizabeth (Bis) Lay, Sony Manning and Simon Lewis. 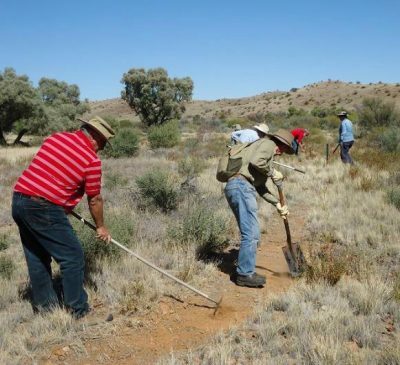 The group had a full day at the Peake Overland Telegraph site on 9th August 2017, focussing on repair of the two walking trails. Some work was also undertaken to prune back vegetation on the track up to the ruins and other vegetation growing over signage. The Creek Walk required substantial work, including repair of water erosion damage, re-routing of sections as a result of shifting spring tails, and installation of two additional marker posts to improve the definition of the trail. Work on the Walk was completed by lunch-time, after which more minor repairs were effected on the Copper Top Smelter and Mine Walk. During this trip the group also visited Elizabeth Springs in the Wabma Kadarbu Mound Springs Conservation Park. It has been suggested previously that FOMS could consider working with DEWNR in establishing a walking trail at Elizabeth Springs but the inspection showed that, for several reasons, a walking trail would not be particularly feasible. 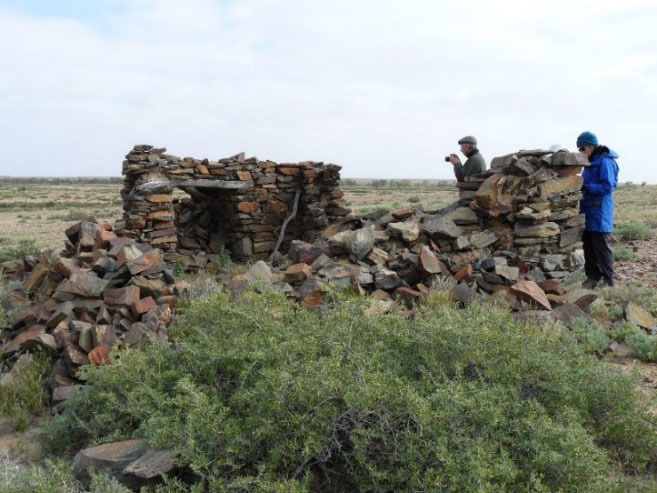 A further highlight of the August 2017 trip was an inspection of the old lime kilns near the Peake Overland Telegraph site. 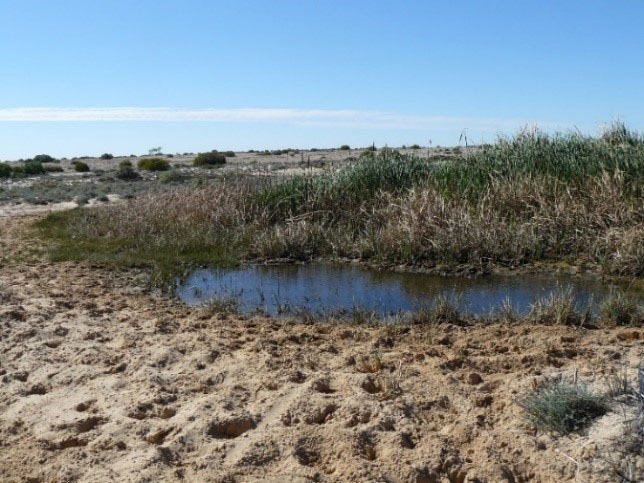 Over the past three years the Department of Environment, Water and Natural Resources (DEWNR), in collaboration with FOMS and others, has been conducting the Desert Jewels project aimed at improved management of mound springs to achieve conservation objectives. A primary area of interest has been the management of reeds (Phragmites), which have tended to proliferate in springs fenced to exclude stock. While Phragmites is a natural component in the landscape in mound spring country, it is thought that many decades of cattle intrusion into the mound springs has elevated nutrient levels and, when stock are excluded from the springs, the elevated nutrients have favoured prolific regrowth of Phragmites at the expense of other vegetation. 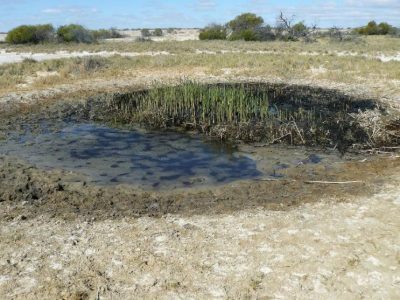 It has been postulated that burning of the Phragmites, possibly in line with traditional Aboriginal burning practices, might be a useful management tool to help restore a more diverse vegetation cover at these springs. 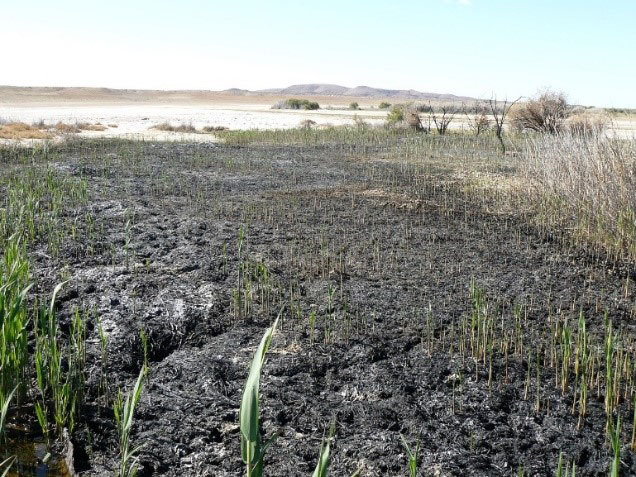 The burning process may help to hasten a decline in nutrient levels in these springs. With this in mind, DEWNR collaborated with the local Arabana people and with FOMS personnel in June 2016 to burn two Phragmites springs on Finniss Springs (Bopeechee Spring and a spring described as HBO004). A trial burn was also conducted at nearby Beatrice spring – a spring with bulrush (Typha) cover rather than Phragmites. Also participating was Dr Jasmin Packer, Postdoctoral Fellow, School of Biological Sciences, University of Adelaide. Dr Packer is working on a project on Phragmites management at a national and international scale and is keen to integrate the information from the mound spring burning trials into her own project. 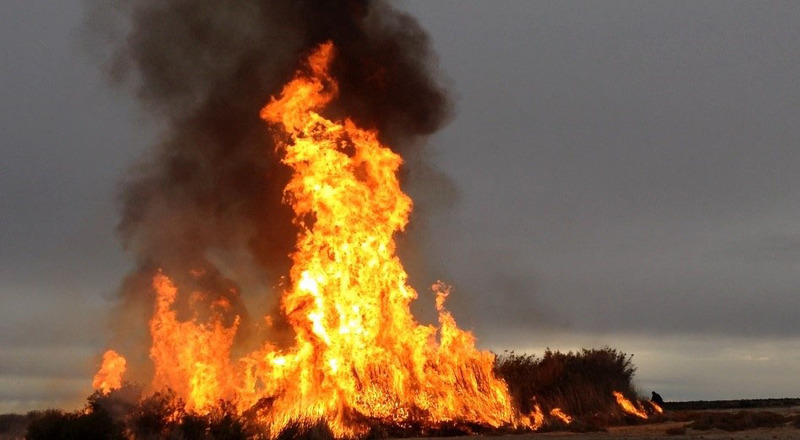 Despite the regular and sometimes heavy rainfall in the Far North during 2016, the burning of Phragmites at Bopeechee and HBO004 springs was very successful burning virtually all above-ground or above-water vegetation and leaving a thick mat of ash. The burning of the Typha spring (Beatrice) was less successful. The Typha was quite green and only a partial burn was possible. In the last week of July 2016 FOMS members Colin Harris, Bruce Gotch, Claire Bockner and Simon Lewis, along with Arabana elder Dean Stuart, paid another visit to Beatrice, Bopeechee and HBO004 springs. 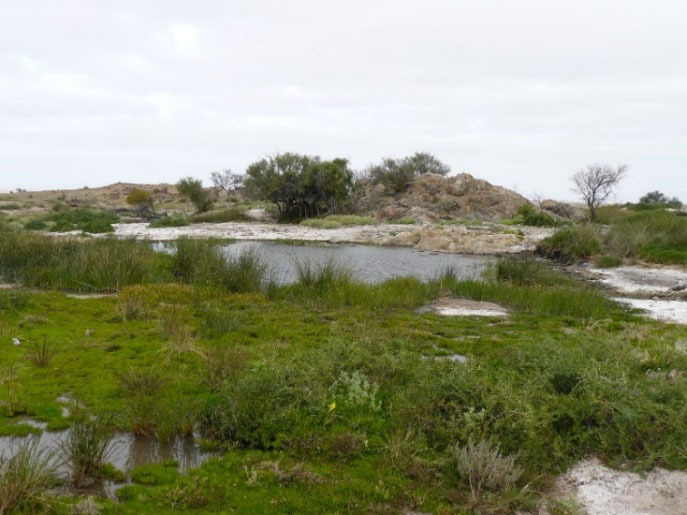 The group was interested to note quite prolific regrowth of Phragmites at Bopeechee and HBO004 just six weeks after the burns – with up to 70 Phragmites stems per square metre up to 0.65m high. 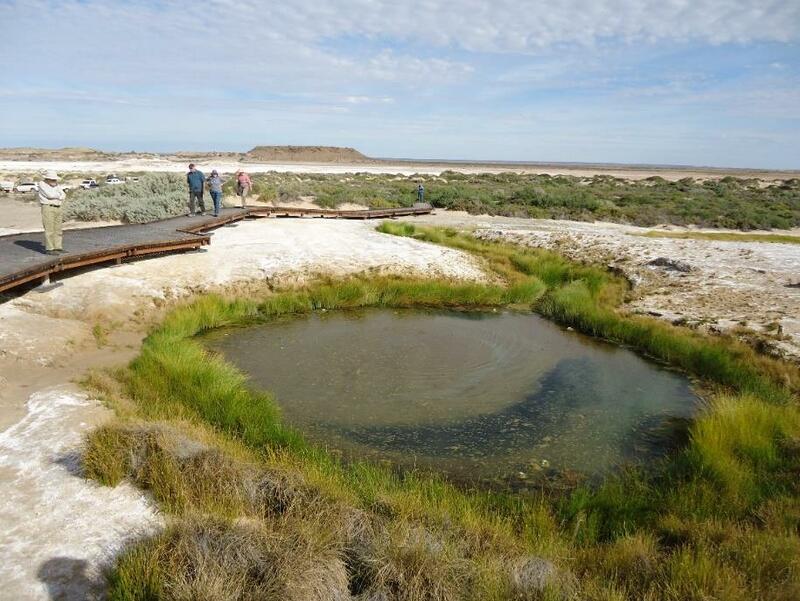 The group repeated a number of one metre square quadrats at these springs to measure the extent of regrowth. It is intended that monitoring will continue at these springs for several years to assess the longer term response of the reeds and of other vegetation associated with the springs. This will link in with monitoring at other springs – such as Outside and the Fountain, on the Peake – where the Phragmites appears to be in a state of natural decline. Another aspect to be considered is whether repeated burning at a particular spring – rather than a single one-off burn – should be trialled as a management option. In the early 1980s, the State Environment agency commissioned studies to document the features and importance of mound springs in South Australia. Eleven springs were identified as being of particular significance and were fenced by the Department in the period 1984 to 1988. 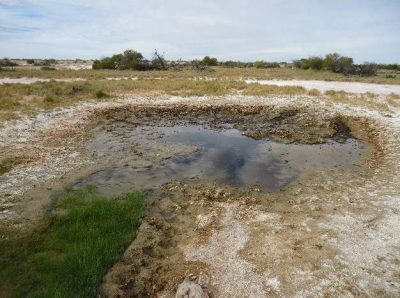 These springs were Blanche Cup, the Bubbler, Coward Spring (all now within Wabma Kadarbu Mound Springs Conservation Park), Strangways Spring (on Anna Creek), Tarlton, Outside, Twelve Mile, Fountain and Big Perry springs (all on the Peake Pastoral Lease), Nilpinna Spring on Nilpinna Pastoral Lease and Big Cadna-Owie Spring on Allandale Pastoral Lease. The Department monitored the condition of these fenced springs from 1984 to 2005. 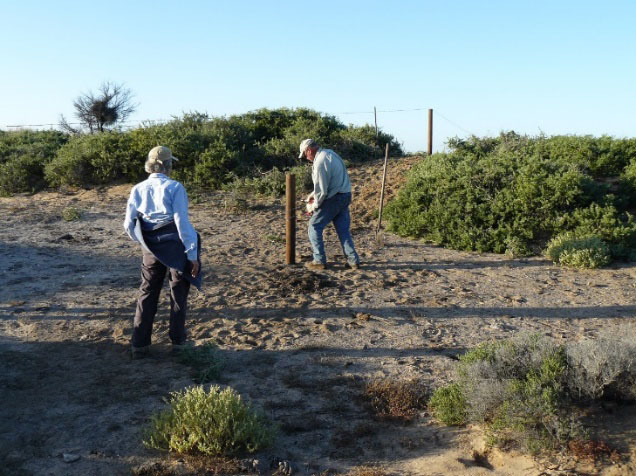 With the exception of occasional fence repairs by Peake station personnel at Twelve Mile and some work to strengthen weak points and install bayonet gates in the early 1990s, the fencing has not been actively maintained. It has lasted well, but is now at a stage where attention is needed. Maintenance and repair work on the fencing around those springs outside of Wabma Kadarbu Mound Springs Conservation Park was one of the main tasks for FOMS volunteers in their trip to the springs in late July 2016. The fenced spring at Strangways did not require attention as this is within the much larger area at Strangways fenced by S Kidman and Co in the mid-1990s. The fencing group in the July 2016 trip comprised Brenton Arnold and Brendan Lay, with support from Bruce Gotch, Bernice Cohen, Colin Harris, Simon Lewis, Elizabeth Lay, Claire Bockner and Arabana elder Dean Stuart. Brenton, still in recovery from a bout of the ‘flu, brought with him a trailer load of fencing materials from Port Augusta. The most arduous fencing work was at Twelve Mile Spring, where there have been problems in the past with cattle breaching a weak section of fence and gaining access to the springs. There, a section of fence needed to be realigned to avoid the vulnerable section. Significant fence work was also needed at the Fountain. Here the spring tail passes through the fence and the fence has become weakened as a result of cattle pugging and eroding the wetland area just outside the fence. Brenton and Bren reinforced this section with star-droppers and additional wiring. At nearby Outside Spring one section of fence needed re-straining. 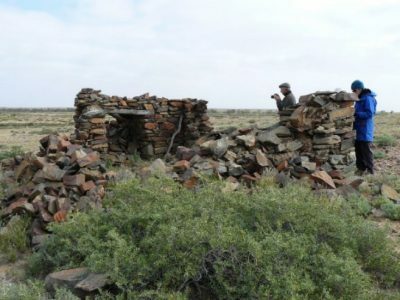 After completing the fencing work on the Peake, the group moved on to Nilpinna Spring, on Nilpinna Station. It was expected that significant repair work might be needed here as the spring area had been burnt three to four years ago – in an attempt to control bamboo growing at the spring – and this burn had damaged part of the fence. However, the singed fence-posts were in reasonable condition, so the task was not quite as great as anticipated. Vegetation was cleared away from the damaged section, the fence was re-strained and a number of spacers replaced. Bayonet gates at each of the above springs were also serviced, with Bruce Gotch taking charge of this work. The bayonet gates were installed in the early 1990s after a particular problem with cattle gaining access through the fence to the Fountain. The design of the bayonet gates is such that cattle cannot get through them from outside but can get through them from inside the fenced area: thus if cattle do gain access through the fence in some way, they do have an opportunity to exit the fenced area via the bayonet gate. While the above work may secure the fenced springs for the next few years, FOMS is concerned that ongoing reliance on volunteers to maintain the fencing is not necessarily the best option. FOMS will be promoting discussions aimed at looking at other partnership approaches that may provide better security for these areas into the longer term. 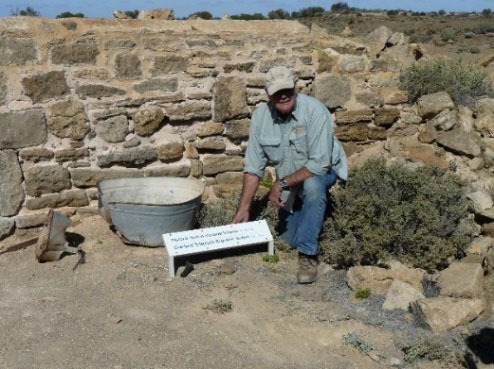 Anyone who has visited the ruins of the former Overland Telegraph Station (and former sheep station buildings) at Strangways Springs will have appreciated the small building identifier signs at each structure. In recent years, the ravages of the climate at Strangways have taken their toll and the identifier signs have deteriorated significantly. In view of this, FOMS liaised with the Department of Environment, Water and Natural Resources (DEWNR) and the Department organised the manufacture of replacement signage. As part of the July 2016 FOMS trip, the new building identifiers were installed by Bruce Gotch and Colin Harris.